Free use of the LA Fitness gym next to the hotel. Set in 100 acres of garden and woodlands - There is a choice of restaurant. The Copthorne London Gatwick is situated in the village of Copthorne, centred around a 16th Century farmhouse and set in 100 acres of garden and woodlands, only minutes from the airport. Dining options include the Lion D'or fine dining restaurant and guests can use the LA Fitness gym which is adjacent to the hotel. Rooms have en-suite bathroom, tea and coffee tray, TV, direct dial telephone, trouser press and hair dryer. All rooms are air conditioned and non smoking. Transfers run every hour every hour between 04:22 and 23:22 outside these hours taxis can be booked at clients own cost. £5 per person, please book seats on arrival at hotel. Space is subject to availability, outside these hours taxis can be booked at clients own cost. There is a choice of restaurant. The fine dining Lion D'or restaurant, The Brasserie restaurant, the Library bar and the White Swan pub which also serves meals. Where dinner is included in the price it will be 2 courses from the Buffet menu in the Brasserie Restaurant. £15.95 per person for a breakfast buffet, If not included in your rate. The adjacent LA Fitness is available to guests and offers Pool, Gym, Tennis and Squash. Swimming cap are compulsory in the pool. Closed 25th,26th Dec and 1st Jan.The swimming pool is currently closed until the end of April 2019 for refurbishment. The gym is open as normal. Where dinner is included in the price it will be 2 courses from the Buffet menu in the Brasserie Restaurant. Bit drab. No atmosphere. Room was clean and comfortable. I wouldn't say this is a 4 star hotel. Reception staff not very friendly. Had another worry free stay at the Copthorne Gatwick with Parking the evening before our flight, All of which was great However I do feel I would stay longer in the Bar, if it was not soooooo expensive. Very clean and well run hotel. A very enjoyable start to the holiday. Next time we will book breakfast! Great hotel to stay at prior to our holiday. The hotel is good but the quality of the food (It was lukewarm) in the public bar left I lot to be desired. I could see in the time I was there at least two customers making complaints. This is supposed to be a 4 star hotel! Great as always! Thanks! However think I must have been fortunate the time before because our bedroom was better! No complaints just that I had come with a friend this time and wanted to really impress with the hotel! Still lovely stay though! Great Hotel , comfortable rooms and always a friendly face to greet you. Lovely food from the bistro . Not tried the White Swan pub lunches but be prepared for High bar tarrifs. Overall love this place . Easy booking on web, nice hotel - certainly suited to our needs for 1 night before our holiday plus parking. Plus side is that your car stays on site at the hotel and it's 20 mins by taxi to the airport. Much cheaper than booking parking at the airport. Best airport hotel we have ever been to. A great start to the holiday,friendly and efficient,clean and comfortable- excellent value for money. Won't consider any where else! 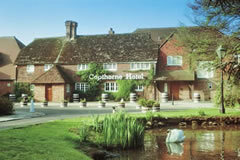 Excellent value at the Copthorne and to get 14 days parking included is a great bonus. Would use again and again. Lovely hotel. Easy to park and no problems. Not far from airport. Great choice of night before flying hotel. Will Def use again. Great hotel ,we paid an extra Â£30 and had a room upgrade ,2 free drinks from the bar and a great breakfast on the morning of our flight. Thanks. please note:- Transfers run to the airport every hour between 04:15 and 23:15 outside these hours taxis can be booked at clients own cost - the local taxi company rates start from £11.50 (subject to change) each way. Transfer Bus costs £5 pp - please book seats on arrival at hotel. Space is subject to availability. The adjacent LA Fitness is available to guests and offers Pool, Gym, Tennis and Squash. Swimming caps are compulsory in the pool. LA Fitness will be closed 25th,26th Dec and 1st Jan. The swimming pool is currently closed until the end of April 2019 for refurbishment. The gym is open as normal.